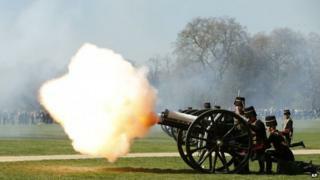 Gun salutes have been fired in London's Hyde Park to mark the Queen's 89th birthday. The monarch is celebrating the occasion privately at Windsor Castle where she has been staying for the past month. In her honour, the King's Troop Royal Horse Artillery staged a 41-gun royal salute in full dress uniform. The salute was followed by a selection of celebratory music from the Band of the Royal Artillery close to the firing position. The King's Troop rode their horses and gun carriages past Buckingham Palace at midday en route to Hyde Park, where they staged their gun salute using six 13-pounder field guns dating from around the time of World War One. An hour later, the Honourable Artillery Company fired a 62-gun royal salute from the river bank at the Tower of London, overlooking HMS Belfast. Three L118 ceremonial light guns, similar to those used in Afghanistan in recent years, were used to fire the salute across the Thames. Gun salutes were also scheduled at Edinburgh and Stirling Castles, Cardiff Castle, and Hillsborough Castle in County Down. The basic royal salute is 21 rounds. A further 20 are fired at royal parks and royal palaces and fortresses and another 21 for being in the City of London. The birthday comes as people begin to gather outside St Mary's Hospital in London in anticipation of the birth of the Queen's newest great-grandchild. The Duchess of Cambridge is expected to give birth there to her and Prince William's second child later this month, with some fans already waiting as long as two weeks outside the hospital. Kensington Palace said Prince William was now on unpaid leave until June after completing the first phase of his in-work air ambulance helicopter pilot training sooner than expected. A palace spokesman said he would return to work after a period of pre-planned official royal engagements in late May. Prince Harry will also briefly return to the UK this weekend, following the Gallipoli commemorations in Turkey, to attend the London Marathon as patron of the London Marathon Charitable Trust. Princess Elizabeth Alexandra Mary was born on 21 April, 1926, at the Mayfair home of her mother's parents, the Earl and Countess of Strathmore. Though the Queen's actual birthday is 21 April, her official birthday is held on a Saturday in June. The tradition of two birthdays dates back to the time when, if monarchs were born in winter, the weather was deemed unsuitable for outdoor events. In Britain the Queen's official birthday is traditionally marked by the Trooping the Colour ceremony in Horse Guards Parade. Meanwhile, Clarence House said the Prince of Wales and Duchess of Cornwall are to visit the Republic of Ireland and Northern Ireland in May. Prince Charles and Camilla's four-day trip will reportedly take them to Mullaghmore, where the prince's great-uncle, Lord Mountbatten, was killed in an IRA bombing in August 1979.